Now that I’m back from Vegas (with $0 spent I might add! ), I’m taking my weekend by storm. Today, I’m headed to a fabulous party hosted by my friend and fellow blogger of The Poe Log. The party – called Porktober™ – is the pork-themed event of the year (you can follow the party progress on Twitter @Real_Porktober). It includes a full roasted pig, bacon bar, and other pork products for all to consume. Clearly, with such a bounty of food, I cannot show up empty-handed. In keeping with my money-saving theme, I wanted to find something that I could make that would be a) fabulous and b) free (well free-ish). 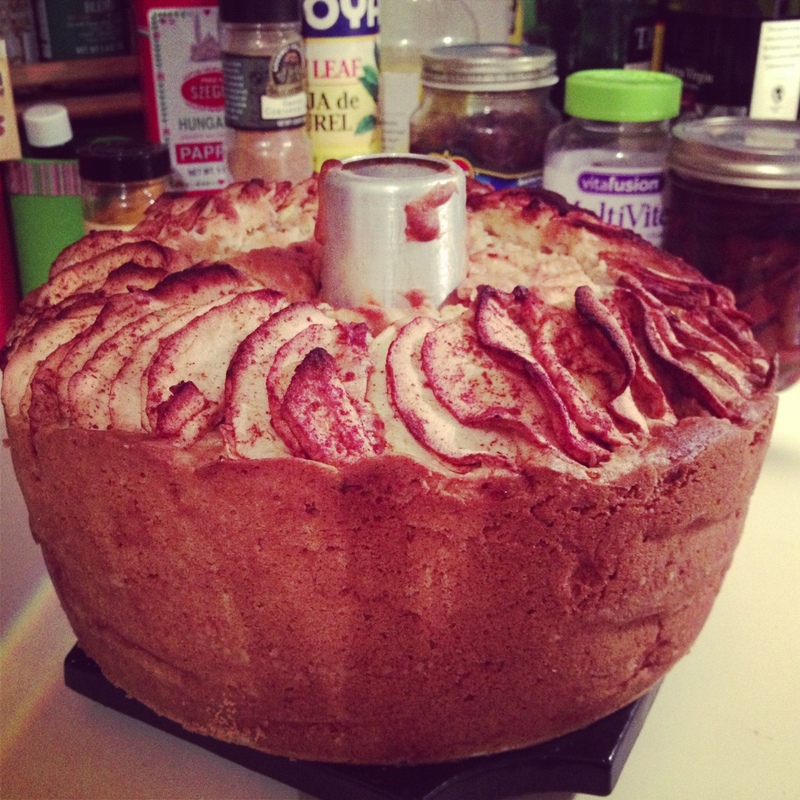 So, I opted to make an apple cake. I recently got some apples after my other friend and fellow blogger of Cardigans and Couture who went apple picking and graciously shared some of her goods with me. I had all of the other ingredients on hand, so it seemed like a no-brainer. Plus, apples and pork go together like my MasterCard and Bloomingdale’s – a perfect match. Here is the recipe courtesy of another friend and her fabulous mom. I hope it tastes as good as it looks! Mixed sliced apples with 6 tsp. of sugar and 3 tsp. of cinnamon and set aside. In a separate bowl, mix remaining sugar, oil, juice, eggs, and vanilla. Sift flour and baking powder together and slowly add to the wet ingredients. Once combined, add in the apple slices reserving enough to layer on the top of the cake. Pour the cake into a greased and floured angel food cake pan and place it in a pre-heated 350° oven. Bake for 1 ½ hours or until a toothpick comes out clean.